The following collection of presentations are collected from various contributors of the DFW Contest Group over the last several years. 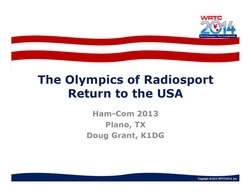 Many of the presentations have been delivered at HamCom as part of the W5 Contest Forum breakout sessions. Click on the image of the slide deck to download the presentation. This presentation covers how to take your contesting to the next level. Intended for anyone who wants to improve their contesting skills. Covers equipment, antennas,, basic and advanced contesting skills and some strategy. An overview of the DXLab Suite of applications. DXLab offers 8 standalone applications that work best together as a suite. Includes Transceiver Control, Logging, Spot Collection, Propagation, QSL routes, DX & QSO Mapping, etc. This presentation covers basic concepts of SO2R station setup and operation. It addresses fundamental elements of SO2R operation and station design for CW and SSB modes. Digital modes are somewhat different and out of scope of this presentation. This presentation focuses on one specific issue - the required elevation angles – a parameter that’s often ignored. Addressing this issue usually leads to stacking Yagis. We’ll see why stacking is needed, the advantages and a real-life example. 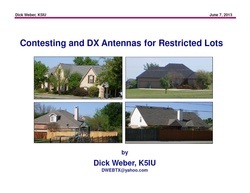 This presentation is intended for operators who are relatively new to 160 meters and who may have an interest in contesting on that band. The information presented will be of use to anyone interested in working DX on 160 meters as well. 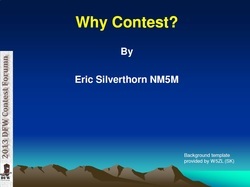 This presentation covers the hardware aspects of good contest station design. Topics include the quality of your transmitted signal, ability to hear well in adverse environments, ergonomics, good station layout and testing. An overview of the importance of keeping up your QSO "rate" by discussing both Running "CQ'ing" and Search & Pounce Techniques. Also discusses setting goals before each contest and good time management. This presentation is an introduction to VHF contesting including frequencies used, fundamental station requirements and contest specifics. Also has a section on operating mobile as well as a section on meteor scatter communications. CQ WW DX Contest - "Classic Overlay"
Presentation by W0UO on the new CQ WW DX Contest - "Classic Overlay" rules. 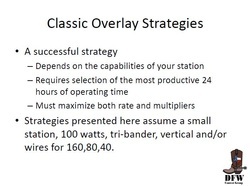 Summary of the rules for the new Classic Overlay category with some strategies for picking the best 24 hour period to operate beginning on slide 6. 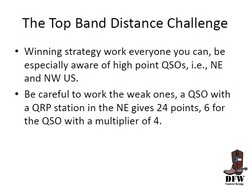 This presentation is a short overview of the rules for the 2013 Stew Perry Top Band Distance Challenge with a little bit of strategy at the end.